The logical companion volume was soldiers in butternut and gray. Faces of the Confederacy: An Album of Southern Soldiers and Their Stories, was born. The project presented a major challenge: Where to find identified, wartime photographs of Confederate soldiers? Compared to images of their Northern counterparts, Southern soldiers are rare. Up for the challenge of locating and securing permissions for the images, I cast a wide net in my search. I contacted fellow private collectors, dealers in Civil War relics, and public libraries, historical societies, and institutions of higher education. The hunt for images lasted two years, and ended in success. Significant challenges also occurred on the research front. Federal pension files, a significant source of information for Union Faces, were not an option for Confederate soldiers or their widows after the war. Other sources, notably county histories and newspapers, filled the void. The extraordinary stories and images of these ordinary men who hailed from across the Confederacy are the result. The cover image selected by The Johns Hopkins University Press is an identified soldier, Sgt. William Crawford Smith of the Twelfth Virginia Infantry. His story appears on pages 151-153 in the book. The choice of this carte de visite contrasts with Union Faces, which features an unidentified soldier to represent the millions of volunteers who served. Although this portrait is of a known soldier, Sgt. Smith’s likeness is representative of the men who enlisted in the Confederate armies after the opening shots were fired at Fort Sumter, South Carolina. Sgt. Smith stands in the studio of E.S. Lumpkin (life dates unknown) & Co., of Richmond, Virginia, grasping a battle flag in his right hand and holding a forage cap in the other hand. He apears to be dressed in his best uniform, complete with tassles, matching buttons, and a fine leather waist belt. His footwear is little worn, and his leggings are clean and unfrayed. The pristine quality of his clothing and the flag suggests that this photograph was taken soon after the end of the war. Lumpkin or an employee tinted the flag and other elements of his uniform. Although this black and white reproduction does not capture the added color, the careful observer will note the saturated tones and sharp edges of the banner. This stunning portrait is part of the William A. Turner collection. Bill’s contribution to the book is enormous. Almost half the cartes pictured on its pages come from his holdings. 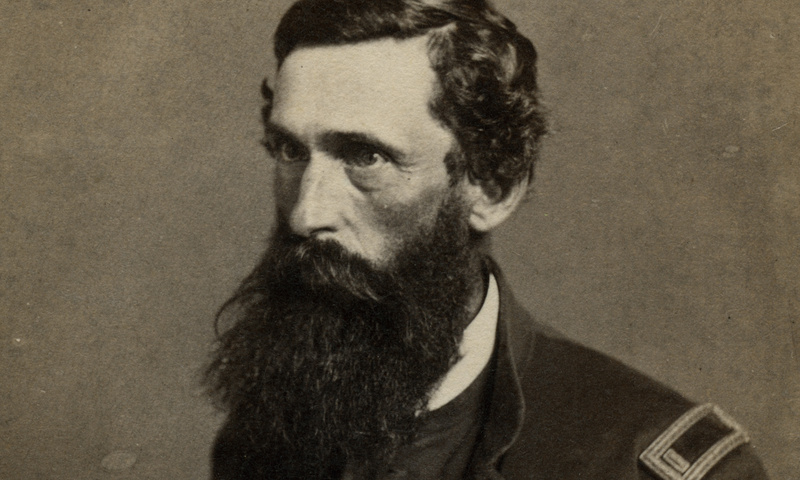 Turner, who died in 2012, was a pioneer collector and dealer who possessed a vast knowledge about Civil War photography and Virginia images in particular. Many of my favorite moments during the course of this project involve chatting with Bill in person and by telephone about a wide range of topics.